Ink & Blood: Dead Sea Scrolls to Gutenberg includes authentic Dead Sea Scrolls, the origins of written language and a working life-size reproduction of the most significant invention of the last millennium, Gutenberg’s Printing Press with moveable type. Totaling more than 100 artifacts, the collection includes 5,000-year-old clay tablets, Hebrew Torahs, ancient Greek texts, Medieval Latin manuscripts, original pages from Gutenberg’s Bible, and rare English printed Bibles. 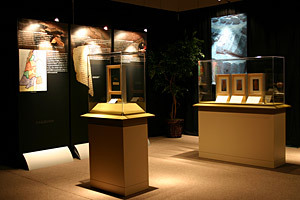 Centerpieces of the exhibition are the live theatrical demonstration at the replica of Gutenberg’s printing press and a dramatic, educational gallery of Dead Sea Scrolls. Ink & Blood: Dead Sea Scrolls to Gutenberg is the largest collection ever assembled to chronicle Western Civilization as seen through one of its most prominent and carefully preserved objets d’art—the Hebrew, Latin and English Bible. Writing began as pictures more than 5000 years ago in ancient Sumer or what is now modern-day Iraq. The oldest known examples of writing incorporate a pictographic script dated before 3000 B.C., called proto-cuneiform. This primitive script soon developed into a syllabic language, called Cuneiform. Ink & Blood displays four proto-cuneiform tablets dating to 3200 B.C. 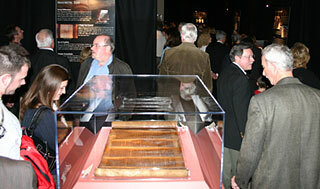 and five cuneiform tablets dating from 2000 B.C.-1500 B.C. During the dark and middle ages, books were expensive to produce and therefore very rare. A Medieval Bible required the skins of 50 to 70 sheep for parchment and took nearly a year to copy the text. The employment of artists and use of colored inks only added to the expense. In the middle of the 15th century, Johann Gutenberg of Mainz, Germany advanced Western Civilization immeasurably with the development of the printing press with movable type. In the first 50 years of printing in Europe after Gutenberg, known as incunabula printing, 15-20 million books were printed. As a result, the masses became educated and birthed an educated middle-class. Ink & Blood presents authentic leaves from Gutenberg’s original Bible, leaves from the Fust & Schoeffer Bible (1462) and a working replica of Gutenberg’s printing press where daily demonstrations are presented. At the turn of the century, Gutenberg’s invention was recognized as the greatest invention of the past millennium. Ink & Blood’s collection spans 5,000 years creating a unique perspective on the growth of Western Civilization. With Dead Sea Scrolls, pages from Gutenberg’s Bible, rare printed Bibles, and more than one-hundred other artifacts, Ink & Blood links thousands of years of growth in the Western world preserved through the ink of the scribes and printers and the blood of martyrs. But more than just a preservation, these artifacts reveal the growth of education and the inevitable new experiment in democracy—America. In the 4th century B.C., the Greek monarchy gained dominance under its greatest king, Alexander III (356 B.C.-323 B.C.). Because of the spread of the Greek language, in the 3rd century B.C. Hellenized Jews began translating their Hebrew Scriptures into Greek. This earliest Greek version of Hebrew Scripture is called Septuagint (LXX), meaning “seventy.” This was the first time in history one culture’s sacred texts were wholly translated into another language. Ink & Blood features three Septuagint pieces including two of the oldest extant portions of Septuagint Exodus in the world. By the end of the 1st century A.D., a new religious group began to emerge. This new group were followers of Jesus of Nazareth, and were called “Christians” (meaning, “little christs.”) By the 2nd century, many Christian writings spread throughout the Eastern Mediterranean as separate documents, later combining to form what is now called the New Testament. During the 3rd century, intense persecution began against Christians and their documents. Today only 50 fragments before the 4th century have survived. Ink & Blood displays one of the rarest extant copies of the New Testament before the 4th century, the Oxyrhynchus Papyrus (P39). The P39 was acquired from Colgate University in 2004. Emperor Constantine I (c.280–337 A.D.) converted to Christianity and ended the persecution of Christians throughout the Roman Empire. Constantine founded a new city on the site of ancient Byzantium and called it Constantinople (modern day Istanbul). Constantinople was the capital city of the Byzantine Empire (Eastern Roman Empire) until finally being conquered by the Ottoman Turks in 1453. Unlike in the West, the Greek language continued as the dominate language. Ink & Blood displays artworks, jewelry, and manuscripts from the Byzantine Empire from the 4th through the early 13th century. Beginning with persecution of Christians under Emperor Diocletian, the 4th century ended with Emperor Theodosius I declaring Christianity the sole legal religion. Power shifted from the state to the church as the Western Roman Empire fell. The authority that once belonged to Caesar transferred to the Bishop of Rome. With the completion of the Latin Vulgate by Jerome and the Church’s decision to preserve the Scriptures in Latin, the use of Latin soon replaced the Greek Language in the West. Ink & Blood features a 16th century statue of Jerome and a 15th century compilation manuscript of Jerome’s letters. The Western Roman Empire would not be united again until the Middle Ages when Charlemagne “Charles the Great” was made Holy Roman Emperor by Pope Leo III on December 25, 800. During the time of the Holy Roman Emperor Charlemagne, miniscule script began replacing the uncial hand of earlier texts. This miniscule script is also called the Carolingian script after Charlemagne’s family. Soon after Charlemagne, universities began to emerge in the West as cathedral schools and the Bible was used as a primary textbook. 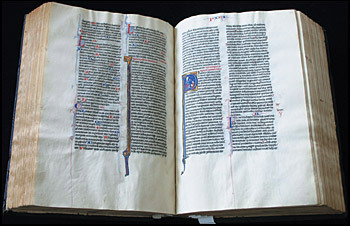 Because of its use as a textbook, the enormous size of Bibles produced at the time had to be reduced to a more manageable, handheld size. Additionally, the books of the Bible had to be placed in a historical order. Stephen Langton, Archbishop of Canterbury and author of the Magna Carta, contributed the standard chapter divisions still used today in 1220. Ink & Blood displays two Illuminated Latin Vulgate manuscripts from the 13th century that features Carolingian script and the standard chapter divisions. Throughout the 15th century, Latin was still the dominant language among the educated, however Latin had died out among the proletariat. Understanding the need for the commoner to be educated, followers of Wyclif translated the Bible into English. With the development of the printing press and the education of the proletariat, the literacy rate increased eventually leading to a dominate middle class. Ink & Blood features a rare manuscript Wycliffite New Testament (c. 1400-1425).